Companies are reporting greater exposure to water risks yet withdrawing more water, according to new research by the non-profit global environmental disclosure platform CDP. 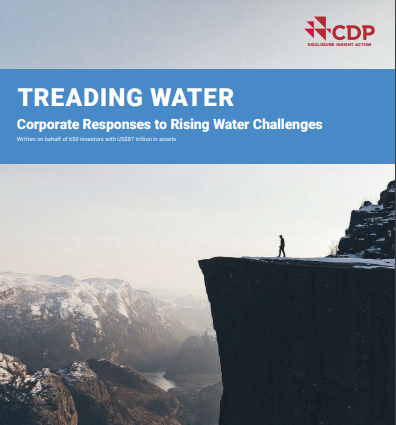 Published on World Water Day by the CDP, the report, Treading Water, analyzes water data from nearly 800 publicly listed companies, responsible for employing over 36 million people worldwide and representing US$18 trillion in market capitalization. Despite the growing risk awareness, and the number of companies setting targets to reduce water withdrawals doubling, there has been an almost 50% rise in the number of companies reporting higher water withdrawals over that same period (2015 – 2018). This is most pronounced for companies operating in Asia and Latin America, as well as in the Food, Beverage and Agriculture, Manufacturing, and Mineral Extraction sectors. With industry accounting for 19% of global water withdrawals and a further 70% coming from agricultural supply chains, companies have a massive role to play in meeting the global water goal – SDG 64. And with three in every four jobs globally dependent on a stable supply of water, and companies reporting US$38 billion in water-related financial losses in 2018, there is a clear economic imperative to act. One area where many companies continue to underperform is when it comes to incentivizing boards to better manage water issues. Despite 93% of companies in the most at-risk industries – such as mining and electric utilities – saying they have board-level oversight of water issues, just 31% have incentives in place for C-Suite executives. With revenues anticipated to reach US$28 trillion this year, this sector is more powerful than ever. Made up of companies near the top of the agricultural value chain, the retail sector has the potential to drive substantial improvements in water performance in meat manufacturers, crop growers and dyehouses around the world.